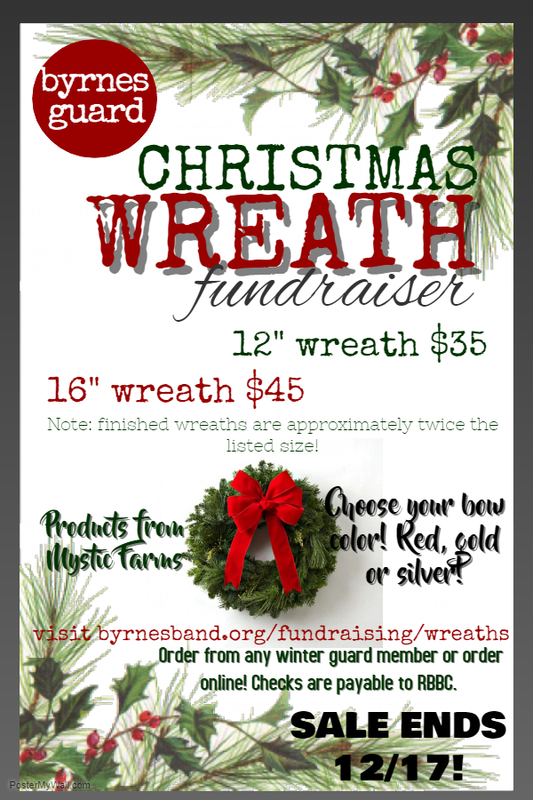 The James F. Byrnes High School Winter Guard Wreath Sale is currently ACTIVE and we will accept orders through December 17th. Wreaths are FRESH and perfect to take as a hostess gift, to decorate for a holiday party, or to just have a festive addition to your home for the holidays. Instead of having dead needles everywhere, get a fresh wreath right before the important events and enjoy for the entire holiday season. We will have order forms and fliers at all three parades in the district! We're Sorry. The Winter Guard Wreath Sale has ended. Pickup will be at Byrnes HS on Thursday, December 21st at 5pm outside of the Fine Arts Center: 150 East Main Street Duncan SC 29334.